Graduating in 2008 with a degree in Economics from Tufts University, I dove headfirst into trading at perhaps the best (or worst?) time to start. With the markets collapsing around me, I oscillated between success and struggle without a consistent edge, scouring textbooks and the internet for anything to assist me as a developing trader. Predictably, other trading education and indicators didn’t help me one bit — something you’ve probably already experienced. 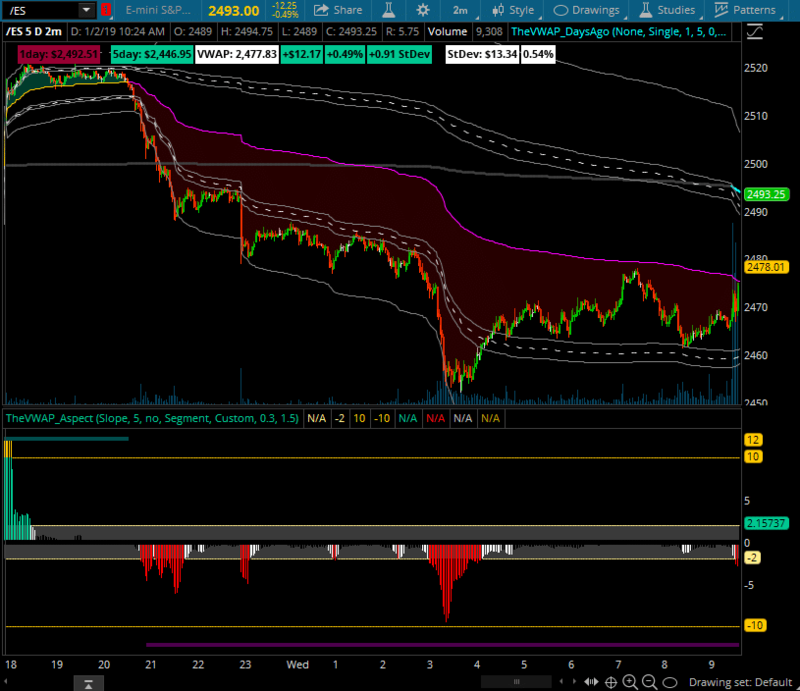 I needed clarity and conviction, but it seemed no one could (or would) teach that… and that’s when I found volume-weighted average price [VWAP]. It instantly clicked with me — market direction was no longer a mystery; trend and counter-trend became as clear as night and day. Years of successful trading later, I’ve created an entire strategy surrounding VWAP, expanding it far beyond the single indicator it was when I first began. Having taught this approach to hundreds of traders, I launched TheVWAP in 2016 as a community and resource for anyone seeking the same clarity I was when I first began. Rarely does trading education offer an epiphany — something you would never have known otherwise. Most frequently, trading education is there to expedite the process — to unlock the door (rather than require you to keep banging your head into it until it opens) so that you may step through. It offers developing traders a path forward (too often at a high cost) to learning what could generate a lifetime of income, and it’s admirable that so many traders commit themselves genuinely to this business. But trading education seems inundated with those seeking to profit from teaching you the basics (that’s why “learn to trade” is a hotly contested Google search phrase!). They recognize a majority of traders DO fail, and thus, the attrition & churn is inevitable — therefore, catering to those making their first foray into the markets is the natural choice. They’d rather capitalize quickly (and materially) on you before you blow up your account. But the traders who need trading education most are intermediate traders — those for whom trading will be a career, not an expensive hobby. By the standards set for ourselves as traders, though, treading water IS failing; intermediate traders simply must add edge wherever possible to avoid a middling, mediocre result. I’m looking to teach those who are smart enough to realize there must be a better way (but aren’t experienced enough to know which ‘way’ is best). If you’re reading this, odds are you’re smarter and more sophisticated than the average trader — so congratulations! …therefore it’s fitting that the marketing is tailored to comparably machismo-inspired aspirations. “Trade to impress your friends, girls with cars, fancy watches and cash!”, they say. Successful marketing shows the viewer what he or she hopes to become, so it’s par for the course to try to draw you in with dreams of riches and the associated respect (which must come with money, right? I think that’s how it works?). If the education was any good, the system would sell itself on its merits. You don’t need ‘the Star’ to promote something worth learning; you don’t need a clearly-overcompensating-for-something orange Lamborghini to distract your students with illusions of grandeur. As for TheVWAP and my trading education, I refer to a quote from the philosopher Aubrey Graham (aka Drake): “My team good / we don’t really need a mascot”. Or “trade from anywhere”! Let me know how you trade when your WiFi drops at a hotel in Bogota, Colombia — or when the power goes out at the coffee shop in Costa Rica. Let me know how managing trades from your smartphone is supposed to give you any advantage over someone like me (with five monitors). It’s pretty slick to base your marketing around travel — because who wouldn’t want to see the world while profiting from the stock market? But it’s just another distracting, dazzling facet to an otherwise unimpressive and ineffective turd. What about other technical analysis? Almost all technical analysis is a derivative of price (ignoring one of the most important components — volume). I’ve seen plenty of impressive indicators out there, but the signal-to-noise ratio is disheartening to say the least. There are hundreds of failed variants of the RSI (compared to the one novel innovation on such an established topic); there are dozens of pivot methodologies with no clear ‘winner’ of the bunch. Doesn’t this worry you? Most other technical analysis is more focused on making you feel better — that you’re on the pulse of the markets, watching your red (or green) squiggly lines oscillate wildly throughout the day — than it could ever make you trade. You should be able to clearly state a logical and intuitive premise for any indicator you use or else you’re unlikely to trust it when the stakes are high. Further compounding the problem is that many other forms of technical analysis are timeframe sensitive — meaning that in order to gain valid insight, you’ve got to get the right indicator AND the right settings AND the right timeframe of chart. I’m proud of the fact that VWAP is timeframe-independent, producing the same result on a 1min, 3min, 5min, 15min, etc. chart. If you have to make 10% in a single trade, this isn’t for you. This strategy doesn’t chase explosive momentum and neither should traders. I designed my VWAP approach to add regularity to my trading schedule and consistency in my returns — NOT to impress you with irresponsible position sizing and stupidly large dollar gains. I’m content banking .50c on a normal stock with a few hundred shares, and you should be, too. It’s not just Risk/Reward — it’s Risk/Reward x Probability. To improve your R/R, you can either minimize risk (better entries, tighter stops) or maximize reward (find larger opportunities). To improve your probability of success, you need to find a more reliable edge. VWAP can provide all three — lower risk, higher reward potential, and heightened probability. Undercapitalized traders are at a severe disadvantage (both financially and psychologically) with both a lack of buying power and a smaller cushion of allotted risk. I’m not going to tell you you can’t trade with a small account — just that you shouldn’t. But since you’re going to trade anyway, let me help you out as much as I can. Reality check: Small gains add up, so don’t kid yourself. “Go big or go home” might sound ballsy, but nobody ever tells you how many of those guys end up back at home. You can’t outpace your losses with huge gains. It’s like playing ONLY offense, hoping to score more points for you than are scored against your (absent) defense. In the meantime, your main focus should be on improving your skill level and mastering the process, not how fast you can grow your account. Continue to save money in your downtime, and look to make small, consistent gains while tightly managing your risk. This skillset and mindset will be crucial throughout every stage of your career, so you should learn it now before you’re trading with substantially more on the line. Traders are intellectually bred to believe that this business is a results-only environment, and I’d agree — but only at the active, professional trading level. For developing traders, it simply MUST be process-driven — not results-driven. Dollar gains are how professional traders keep score; incremental, personal strides are how developing traders keep score until they enter the section of their career measured in results. There’s no shame in that, though other marketers will tell you otherwise… but only because it’s their job to do so, trying to motivate you to “prove yourself” with brag-worthy dollar gains. The truth is, nobody cares. Nobody celebrates your victories; nobody mourns your losses. You should only care about bettering yourself (and eventually your account, as well) — because confidence comes from competence, not the other way around. Too often, traders vastly underutilize the technology to which they have access. We have immensely powerful machines finding stocks making new highs or lows for the day as if that’s some masterful use of the tools at our disposal. Infuriatingly, we’re shifting the computational burden from the computer (whose job is, literally, to compute things) to our brains, simply because we struggle to communicate our intent to our technology. Consider asking yourself, “What am I good at, and what is my computer good at?” — and then, “So why am I doing the things my computer is better at than I am?”. Are you leveraging the real-time charting, coding/scripting languages, analytics tools and visualization possibilities to their fullest potential? You’re not? That’s fine. Now we need to fix it. We shouldn’t dream of having access to MORE data; we should dream of having command and control over the data to which we already have access. We don’t need more; we need better understanding of the already-existing information — through quantitative, interpretive or aesthetic means. Your goal isn’t just maximizing profitability; it’s maximizing efficiency. We can’t all be money-printing machines (like high-frequency traders), but you can take better advantage of being a trader in the modern era. We aren’t living in the 1990’s — and we shouldn’t be trading like it, either.